The NuPower™ 11C01A Multi-Octave Power Amplifier (MOPA) utilizes GaN technology to deliver 15 watts of RF power for CW and near-constant-envelope waveforms from 225 MHz to 2.4 GHz, covering VHF, UHF, L-band and S-band frequencies. Based on the latest Gallium Nitride (GaN) technology, the NuPower 11C01A’s 25% to 45% power efficiency and 3.9 cubic inch form factor brings state-of-the-art power amplifier technology to the warfighter, meeting present challenges in size, weight, and power (SWaP) reduction. 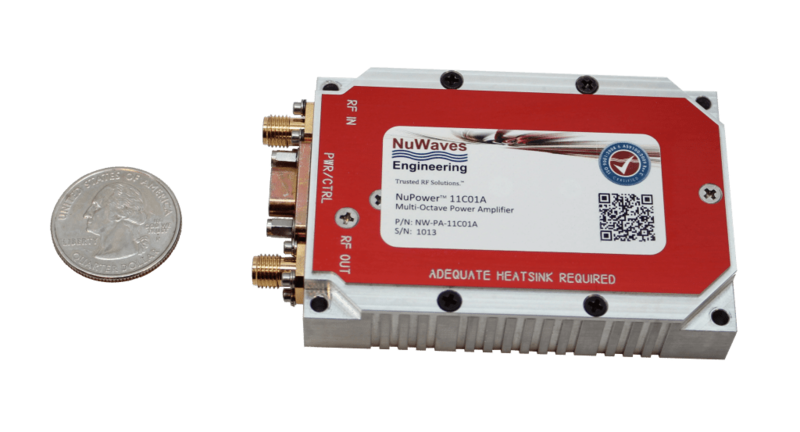 The NuPower 11C01A is ideal for broadband RF telemetry and tactical communication systems that require high reliability and high efficiency in a very compact housing. All NuPower PAs come standard with a Micro-D connector with 18″ flying leads for interfacing to the unit. Available options for the PA include fan-cooled heat sink, and an interface cable with banana plug terminations for lab testing.